Titled retrospectively after a single released by “Godfather of Soul” James Brown in 1965, this work combines images of the era’s most potent cultural and political references. In addition to an image of Brown at top right, it incorporates pictures of boxer Cassius Clay (who claimed the heavyweight title from Sonny Liston in February 1964), The Rolling Stones (who made their first US appearances in 1964) and Lee Harvey Oswald (who had assassinated JFK the previous year). 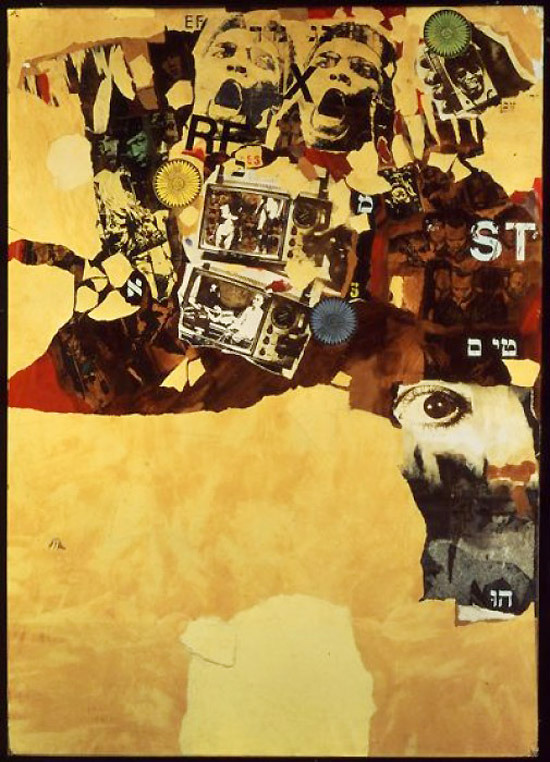 Berman ran found photographs through a Verifax machine, a predecessor of the photocopier, before collaging them and applying transfer lettering in Roman and Hebrew script. The image of the hand-held transistor radio at top right would reappear in several of Berman’s other Verifax works. Unlike the grids of repeated imagery found in most of the other Verifaxes he made, the more free-form layout of elements in Papa’s Got a Brand New Bag evokes the musical riffs that befit some of its jazz and rock ‘n’ roll subjects.